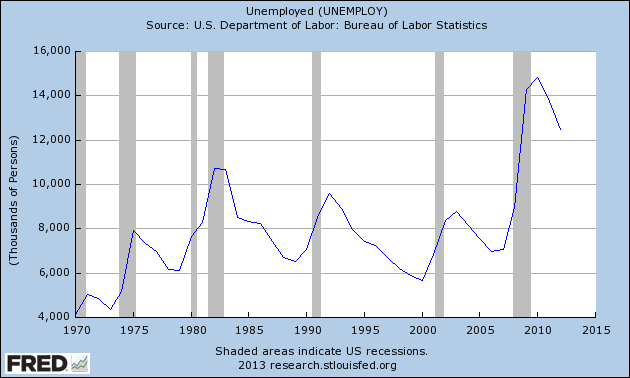 Has the Labor Market Adjusted? – A Keynesian Price Floor and Employment Dynamics | This is Ashok. Using a long state-year panel on the population of private- sector employers in the United States, we find that the minimum wage reduces net job growth, primarily through its effect on job creation by expanding establishments. I don’t want to critique this study as much as use it as a window into an equally curious debate: sticky wages and a Keynesian recession. The standard theory holds that downward wage inflexibility results in disemployment as wages are kept artificially high for any number of reasons. In many ways, the sticky wage thesis posits the same transmission mechanism as the classical view that minimum wage creates unemployment (the policy ramifications are unclear, and I support an increase in the minimum wage, but that’s because I think more unemployment of the right kind is good). Meer and West offer both empirical and theoretical reasons why observing employment growth, and not level, is economically appropriate which implies that employment growth – adjusted for population – is a better indicator of potential gap than unemployment rate. This is important considering “potential income” is a remarkably abstract concept based on estimates of long-run supply-side factors that cannot be evident contemporaneously. Indeed, if the Keynesian argument is to be accepted in whole, contraction of aggregate supply is one possible reason we are not experiencing outright deflation. (Edit: I want to point out here that this pattern isn’t new, and I’m not the first to point it out. I only find it suddenly relevant in the context of the paper I cited which tells us that if stickiness and minimum wages act similarly, we’re now at the point where the sticky effect is less relevant. This can be a good thing since it implies job growth is faster, but it also means the recovery will not be accelerating. That’s a big “if” but has theoretical appeal in concert with the fact that historically other points at which job creation reaches it’s pre-recession peak represent an adjusted labor market. One way to interpret this is a continuing recovery without the acceleration our output gap might suggest I’ve suggested below a few reasons why this may not be the case). While the level of unemployed workers remains uncomfortably high, the rate at which that level is falling is back at its pre-recession high – and there is little precedent for it to rise any further. This does not mean the recession is over, or that aggregate demand is sufficiently high. It does mean that, were we to use the same logic as Meer and West, sticky wages and a dis-equilibrated labor market cannot sufficiently explain our troubles. The Meer and West employment dynamic cannot be translated to a Keynesian “sticky minimum wage”, if you will. This may well be the case – the empirical foundation of their paper considers the economy at all times. The conclusion we strive to make concerns economies specifically mired in recession, which may be a confounding variable. Wages are not as sticky as we believed and even the low dose of price level inflation since 2008 has been sufficient to adjust the market. Aggregate supply has contracted more than we would like to admit. An amalgam of points (2) and (3) suggest that the potential gap is not as high as estimated by the CBO. Excess capacity and other Keynesian forces are far stronger than we previously anticipated. As far as policy is concerned, the result in its crudest suggests we are no longer in a Keynesian short-run, if sticky wages are the only important factor. This means that while inflation will have its traditionally expansionary effect through the money illusion and wealth and “hot potato” effects, it will no longer move the labor market towards equilibrium. In other words, the marginal benefit of a change in the price level is falling towards zero. The evidence is too clear that further deficit-spending will not spark the bond vigilantes and that debt monetization will not bring rise to runaway inflation; therefore, it is unlikely that the United States should engage in any further austerity by prolonging the sequester and January payroll tax hikes. However, we should perhaps question the modality of sticky wages vis-a-vis the unemployment rate, and focus on employment growth which suggests a more robust recovery relative to supply. This is not a call for a smaller government. Indeed with interest rates at historical lows, now is as good a time as ever for the government to engage in sound investments like green energy, smart grids, or infrastructure. Now is as good a time as ever to risk monumental tax reform that brings in too little, rather than too much. Ultimately, the evidence for large output gaps and lacking demand is far greater than the evidence against – and perhaps in the throes of fiscal crisis we should have engaged in more aggressive stimulus. Indeed, just one paper suggesting a relationship elsewhere unfound and theoretically unprecedented should not change our interpretation of the economy too seriously. But Meer and West have given us a unique prism to consider not just minimum wages, but maximum employment. (That last sentence had more cadence than content: the point is not maximum unemployment, as much as a maximum rate of recovery – to many that is disheartening). 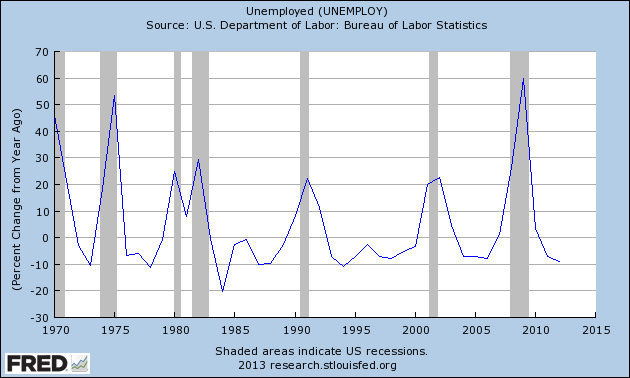 Pingback: Has the U.S. labor market adjusted? Pingback: TheMoneyIllusion » With friends like Brad DeLong . . . I think this bit is particularly interesting “we are no longer in a Keynesian short-run, if sticky wages are the only important factor. This means that while inflation will have its traditionally expansionary effect through the money illusion and wealth and “hot potato” effects, it will no longer move the labor market towards equilibrium. In other words, the marginal benefit of a change in the price level is falling towards zero”. 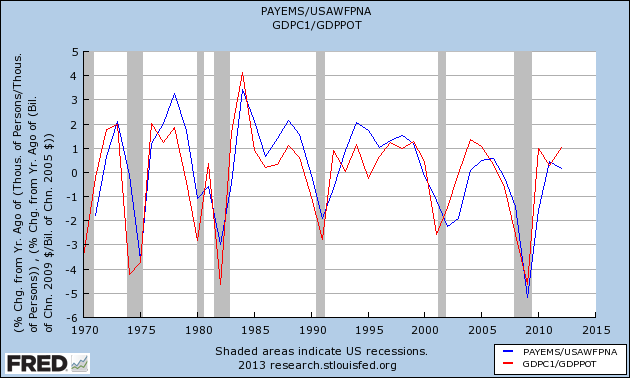 The overall arching and linking point is that we have and, even before the crisis, we had a relative slow job growth. This was due to whatever (globalisation, superstar economics etc) but the bottom line is that AD is suffering and thus so is top line growth and thus so is business investment. We might ‘recover’ (and, to be honest, the US and UK are doing somewhat better than I had expected) but we won’t get on a truly re-accelerating trajectory until AD and/or job growth and/or labour share of GDP is fixed. I think your second point regarding hourly wages is interesting. I’ll have to think about it more. I think QE is still useful because having higher inflation is good for a variety of reasons, not the least it reduces risk of a future liquidity trap. I agree with the fact that we’re recovering, but the much-needed acceleration seems to be dwindling in chance. I don’t think you properly grok MM on this. Sumner is the FIRST guy to say Minimum Wage is horrible. He’s a fan on GI CYB, which delivers 30M new jobs starting at $1 per hour basically overnight. And that is the real lesson of the study. That there are true negative effects from a BAD THING. That Sumner advocates a expansion of the base RIGHT NOW is about staying on the brutal LT of say 4.5% NGDP – rain of shine, htt that number monthly. He DOES NOT guarantee that NGDPLT ends unemployment – thats why he’ll say outright GI CYB is the true solution, because ultimately MW is a terrible way to deliver a safety net. The correct solution is GI CYB, we need NGDPLT to essential help reverse the size of the state. Take this further. Today, the ability to negotiate what you want is largely expressed in “money” which is largely associated with employment. In a world where 99% of the population live off government printed ration coupons (that is, money) which divy up the output of 1% of the population, that 1% will end up with disproportiate powers, both obvious and subtle. In short, your ability to influence what is produced is to some degree limited by what you yourself produce that others want. Hand out enough redistributed “money” to level that out, and other constructions will appear. It’s not hard to imagine a world where you can do “no work” and are simply given a quite adequate ration of food, entertainment, clothing, and so on. And have surprizingly limited choices in what you can actually do, where you can live, etc. Wealth and inequality will be measured by powers of choice and powers of influence over technical matters. You will ALWAYS be made to work 40 hours, it increases consumption for the poor. about this website and now this time I am visiting this web site and reading veryy informative articles or reviews at thijs time.